Bootstrap Finance is a craft that is very widely used in the creation of new ventures. In tough economic times it can be a matter of survival, once the business has started. For many entrepreneurs, it is a natural behavior, others need an apprenticeship. Here is some help. Don’t hesitate to ask for more. To use Bootstrap Finance is to build a business with little or no capital. The entrepreneur uses imagination, ingenuity and hard work instead of seeking outside finance. 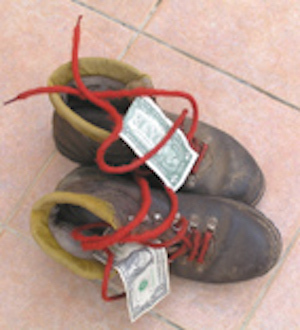 Bootstrapped ventures earn money—funded ventures spend money! The three top jobs are: #1: Sales—to generate revenue (the best form of finance); #2: Cash Management—to maintain a credit balance at the bank (and avoid loans, even if you can get them); #3: Low Fixed Costs—only spend money when you have to (lowering variable cost is easier, but cutting fixed costs can be expensive). How Little Money Do You Need? Before you start, ask, “How little money do I need?” Not “How much money do I need?” Some say too much money is worse than too little, so even if you have big ideas you can still use bootstrap finance. You can burn dollar bills very fast at the start and you are going to need every penny as sales begin to take off, to finance that growth. opportunity for higher profits when you get there. If you only need small sums, what about a yard sale? If you need slightly more, why not consider sending unwanted items of value to auction? Create a website and seek passive income as an affiliate of related businesses. Use your networks to get help—there are many ambassadors out there. Vator (short for innovator) is a professional network for entrepreneurs, where you can pitch your business on line at no or lo-cost–and is by consequence a good place to start bootstrap finance. Founded and run by journalist Bambi Francisco, Vator consists of Vator.tv as well as VatorNews, Vator’s news site focused on the business and trends of high-tech entrepreneurship and innovation. Make use of all those Apps available for free and, oh yes, use Twitter and the social media for getting your message over. Watch your ‘receivables’ like a hawk; cash flow is critical at any time, but when you start a business, nothing is more important and late payments can cripple you. During the 11 years I had my main business, our collection period never went out beyond 38 days! Read my eBook, Founders Stay Afloat: by tracking 25 vital facts and figures. All finance is not created equal, including in the realm of bootstrap finance. It is logical to the financial institutions, but you may feel that it is unfair that if you do not have collateral, you have no track record in business and worst, if you have a poor credit history, you will be charged high rates of interest and be asked for a personal guarantee. It could seem that those who do not need the money get charged the lowest rates. If you are looking for traditional bank loans, you are very likely to be invited to consider getting a 7(a) SBA loan guaranty. If so, take a look at the Quick Reference Guide to SBA loan guaranty programs that you can download from here in PDF form. Another handy tool is offered by BoeFly that streamlines loan origination through technology, by utilizing member banks’ criteria to match compatible parties, by making the process more efficient using BoeFly’s tools and services, and by expanding access to borrowers/lenders both within and outside of ones geographical area. There are many ways round the problem of raising loan finance. The one most frequently used is Person-to-Person, or P2P lending. Borrowing from family and friends will frequently enable you to borrow money at more favorable rates. Community Banks may well be an easier route to loans for startups. The point of decision making will be much closer to the lending officer that you deal with. Most of them did not get snarled up in sub-prime lending and have cleaner balance sheets than many of the large banks. They channel most of their loans to the neighborhoods where their depositors live and work. Many community banks are willing to consider character, family history and discretionary spending in making loans. Seek soft loans or loan guarantees that government institutions offer for small business or minorities. For example, I used to work with Community Capital of Vermont—a non-profit that offers unsecured loans to deserving cases in the Green Mountain State. Community Supported Business is a new way of borrowing from customers and itself is a form of bootstrap finance. In the US and other countries, the concept of Community Supported Agriculture (CSA) is quite well developed. It involves a ‘community’ of customers paying a lump sum before the season and taking delivery of produce as it is harvested. This enables the grower to have money up-front for planting and cultivating and the consumer to have a regular supply of produce—locally. There is every reason why the principle has been applied to other sectors. Don Debelak’s book, The Risk-Free Entrepreneur—The Idea Person’s Guide to Building a Business With Other People’s Money is good not only for inventors, but startup artists of all kinds. Finance is is best raised from the right partners at the right time. The internet has enabled what has come to be known as P2P, or Person-to-Person communication and it applies to finance both for personal and (small) business finance. Chances are high that you will finance the business from your own personal resources and borrowing from friends and family. If so you are making use of bootstrap finance without even calling it that. Not only as a result of the credit squeeze, there is a growing trend towards business borrowing and capital financing from people you know. There are a number of P2P loan organizing web-based companies, such as Lending Club and Prosper. There are not many, since regulatory authorities watch them very closely. The wider aspect of what is called Social Finance and Affinity Capital takes you into the realm of thinking about finance and capital in a sustainable way, whereby you give expression to your personal ethos in financial transactions. The most exciting development in P2P finance is Crowdfunding. It’s the social networking Facebook generation way of raising finance for all kinds of projects in business, non-profits, and the arts. Crowdsourcing will become a way of marshaling dollars to back enthusiasm for innovations. See the Venture Founders Directory of Crowdfunding. If you do borrow money from friends and family, do not enter into the loans without proper legal arrangements. While relationship may be enough to get the support, the actual transaction must be done correctly, or you will not only endanger the business, but worse, you will endanger those relationships. If you do borrow, then the procedure is quite straightforward. You will need to draw up a promissory note to set it down in a legally binding way for both parties. A very good source of free promissory notes for you to consider can be found at docstoc. Using docstoc is a form of bootstrap finance, given how much less expensive a route to legal documents it is by comparison with attorneys. Choose or modify a promissory note that meets your needs and if you have the slightest hesitance about signing, pass it by your attorney. You can get Promissory Notes from Nolo. A new venture will be tempted to make investments in equipment sooner than is really necessary. Even leasing rather than buying outright may be unwise. The question to raise is about the equipment utilization. Sharing a piece of equipment with another business locally may make more sense, or if another organization already has what you need, they may be prepared to sell you time on their equipment. You may also be able to share skills. If you don’t have enough work for a full-time bookkeeper and don’t want to subcontract the work, you may find someone else in a similar position. Perhaps you can employ a bookkeeper between you; this might not amount to bootstrap finance, but the effect is the same (saving cost). When I started my first company, I needed the books kept, and decided to have my secretary do some very basic bookkeeping training. When you have scaled the business, you may want to have all activities in-house, but at the beginning it is wise to seek partners actively. How can you save expenditure together. Of course, you need to find partners whom you can trust and who have a similar approach to doing business. This is often especially true if your size or breadth of activity prevents you from bidding for large contracts. The first independent company we launched, soon had several such partnerships. Partnering is reasonably commonplace in business today and for some time a new term has entered the vernacular: co-opetition. This is where you do something with a competitor that stops short of breaking the law on restrictive practices. Such an activity might involve sharing an exhibition booth at a trade show, or developing common components for each of your products to reduce the cost. Coworking is a style of work which involves a shared working environment, sometimes an office, yet independent activity. Unlike in a typical office environment, those coworking are usually not employed by the same organization. They may decide on collective ownership of things that they don’t need top own individually–like expensive office equipment that is used sporadically. The coworking movement strives to combine the relaxed working environment of the home office with a dynamic social atmosphere. Make sure to consult the Venture Founders Coworking Directory—USA. A Virtual Office is a combination of off-site live communication and address services that allow users to reduce traditional office costs while maintaining business professionalism. Frequently the term is confused with “office business centers” or “executive suites” which demand a conventional lease whereas a true virtual office does not require that expense. Working out of a coffee shop has become the habit of many and not just the Millenials (adolescents-mid thirties). A Virtual Assistant is an entrepreneur who provides professional administrative, technical, or creative (social) assistance to clients from a home office. Because virtual assistants are independent contractors rather than employees, clients are not responsible for any employee-related taxes, insurance or benefits. Clients also avoid the logistical problem of providing extra office space, equipment or supplies.